Operational excellence cannot be achieved by technology alone. An effective sales and operations planning process is essential to successfully implementing any integrated management system. 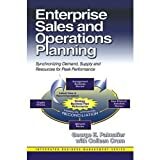 Enterprise Sales and Operations Planning illustrates the effective real-world implementation of this powerful process.